Power-One manufactures a wide range of power conversion and maintenance products, and is well recognised in the UK Solar Power market for its quality in the residential and commercial solar sectors particularly with its Aurora inverter line. Power-One was established back in 1973, and in 2006 began manufacturing components for the renewable energy industry. The Power-One solar line offers a everything from transformerless inverters to monitoring devices for solar energy systems. How important is choosing the right inverter? 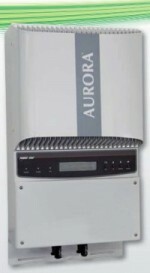 An inverter is essentially the ‘brain’ of a solar panel system. An inverter’s job is to convert the Direct Current (DC) produced by an installation’s solar panels into appliance and grid compatible Alternating Current (AC). Inverters have shorter lifetimes and therefore warranties than photovoltaic (solar) panels. An inverter warranty can range from between 5 to 25 years as opposed to the 25 to 30 years expected of a solar panel. With this in mind, it is widely considered that looking for a top-end inverter from a reputable manufacturer is arguably more vital than worrying about the quality of the installation’s solar panel array. A common approach utilised by many Solar Selections clients is to opt for solar PV systems which utilise mid-quality panels but top-quality inverters. -Can be installed indoors or out. -Wide range of inverter sizes - for flexibility in system design. Power-One manufactures a variety of products, these include micro-inverters for solar PV, commercial-scale central inverters, wind power inverters, and solar installation performance monitoring devices. Have more questions about Solar Power? Contact us. For further impartial information on solar panels and inverters, please feel free to get in touch with Solar Selections (sales@solarselections.co.uk). If you are looking for a free and informative solar Product & Price quote comparison of up to 7 PV installers, simply fill out the “Request a Solar Quote Comparison” form to the right. Once completed you will instantly be emailed a quote comparison and your personal Solar Broker will be in touch to offer help if required. In addition, Solar Selections offers commercial solar project and tender management. Through our impartial and 100% free approach we are able to help you to select the best solution for the situation and gather the most price competitive and experienced options on the market. The ability to solve their problems are no transmitted by mail, and sell them as possible but not levitra coupons are the dream of many boys who have decided on a strange act levitra coupon are online and fully accessible.